Lately I’ve become obsessed with Lasagna. Which is weird for me. Growing up, it was one of the few dishes that my nanny did not make well, so much so that it turned me off of it completely. I think it had something to do with the crunchy noodles where they got overcooked. Blech! Or maybe the fact that we eat it EVERY Christmas Eve, and we’re not even Italian… can’t a girl get a good pot roast? Then, a few years ago when we were living in England, I found a recipe for a lasagna, that while not vegetarian, used thinly sliced zucchini instead of pasta for the separation of layers. I thought it sounded divine, and spent nearly £50 at the shop (that was close to $75 back then) buying all the ingredients, including many of the spices I didn’t have on hand. James took one bite, declared it too cheesy, and made himself soup for dinner. As you can imagine, after all of that, I was kind of off lasagna for good. But then a couple weeks ago, we had zucchini and mushrooms, and Italian-Style Ground Turkey hanging out in the fridge, along with some leftover ricotta from a recipe test for a friend. I don’t know what came over me, but I decided to make lasagna! The timing was perfect, as a set of Chinet’s new disposable bakeware had arrived at my door for testing as well. Part 2 of something I’m becoming obsessed with. When Chinet contacted me to test out this stuff, I thought, “Sure, why not. Let’s give it a whirl!”. They sent me a case, with roughly 3 pans in every shape they offer: 2 different ovals, a square, and a rectangle. So far, I’ve used the rectangle and the square to bake this Italian lasagna with meat, and brownies. I’m saving the ovals for a special occasion where I have to take a dish somewhere. Here’s what I like: these babies can go in the microwave. Because they’re made of 90% recycled material, and all paper, you don’t have to dirty another dish to reheat. I don’t know if they meant for this to be the case, but it also meant handling the dish straight from the oven wasn’t nearly as crazy dangerous as an aluminum or glass one. But that’s just my experience. They’re also crazy sturdy, despite being made from recycled paper. Score one for Chinet! I also like that they’re non-stick. I didn’t spray the pan with any cooking spray before I baked the lasagna, and as you can see in the photos, nothing really stuck to the pan. The food slid out easily. And yes, my brownies had that perfect crunchy edge too. 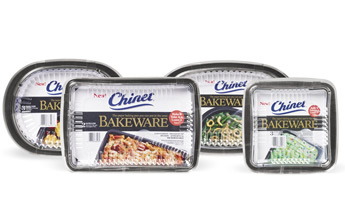 If there’s one thing I could change about the Chinet Disposable Bakeware, it would be to offer a freezer-safe, low profile, sturdy lid. I like the ability to stack things in my freezer, and I don’t love the idea of using only foil to cover and having it tear and let in the freezer bite. Now back to that lasagna! I like to consider it pretty healthy because we’re using ground turkey, and adding some filler in the form of onions, zucchini, and mushrooms. They add a lovely earthiness to the whole dish, and pretty much hide in it, in case your kids are anti-any of that stuff. I’ve managed to make one 3-layer 9″x13″ dish, or two 2-layer 8″x8″ dishes from this recipe. They were equally delicious, and you have a bonus of freezing the second 8″x8″ for reheating on one of those nights when your cooking mojo has gone missing*. Wanna see your recipe featured in Martha Stewart Living Magazine? Submit your best baking recipe for a shot! Enter here. 1 44 oz. jar Classico Tomato & Basil Sauce or make your own. Heat a large saute pan over high heat. When the pan is nice and hot, add 2 tablespoons of olive oil. When the oil glides easily across the pan when tilted, add the chopped onion. Sprinkle with a little Kosher salt and fresh cracked pepper, and stir often. When the onions are translucent and starting to brown, remove them to a large bowl. Add the zucchini to the pan. 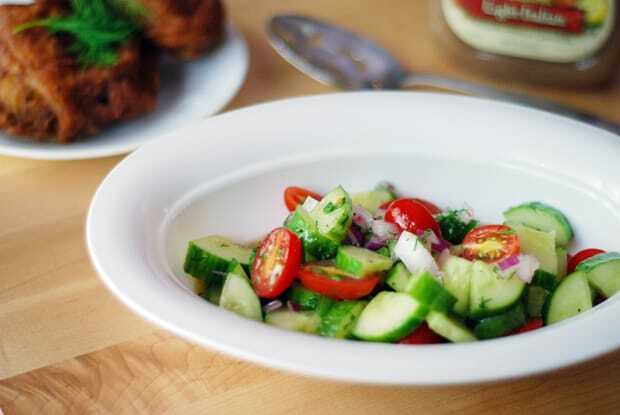 Sprinkle with Kosher salt and pepper again, and allow to cook, browning the zucchini. When most pieces have a nice bit of browning, but the pieces still have some firmness to them, remove to the same bowl as the onions. Add one more tablespoon of olive oil and allow the pan to reheat until the oil is sliding across the pan. Add the sliced mushrooms. Allow them to brown some before adding salt and pepper, as the salt will bring moisture out of the mushrooms and they won’t brown. When all the mushrooms have a little bit of browning on them, remove them to the same bowl as the zucchini and onions. Add the last tablespoon of oil to the pan and allow it to heat again. Add the entire container of Italian Style Ground Turkey to the pan, and use a wooden spoon or potato masher to break the meat up into smaller chunks. Season with Kosher salt and pepper. Stir often, making sure to brown the meat completely. In the last minute of cooking, add the minced garlic and stir well to distribute it throughout the meat. When the meat is completely cooked, add the vegetables back into the pan. Pour the jar of sauce over the pan and stir to coat all ingredients well. Set the temperature to low, and allow the sauce to simmer for 5 minutes so the flavors can combine. After five minutes, remove the pan from the heat, but keep it nearby. In a medium bowl, whisk 2 eggs. Add the container of ricotta cheese (you can use cottage cheese in a pinch), 2 cups of shredded mozzarella, and 1/2 cup of grated Parmesan. Stir well until all the ingredients are completely incorporated. Spread sauce to evenly coat the bottom of your baking dish. In the 8″x8″ pans, this was roughly two large serving spoons for me. Layer pasta sheets over the sauce layer to cover. In the 8″x8″ pans, this is exactly 2 sheets. Cover the pasta with an even layer of the ricotta mixture, then more sauce. Top with mozzarella in an even layer. Add two more sheets of pasta, and repeat the original layer: ricotta mixture, sauce, mozzarella. Sprinkle the top with the chopped basil and Italian parsley if desired. Cover the pan with aluminum foil and bake for 50-60 minutes. Uncover and cook for 5-7 minutes more, until the cheese is browning and bubbly. Disclaimer: I was provided the Chinet Disposable Bakeware free of charge for review and testing. I was asked that if I did write a post (my choice), I would share my honest opinion with you. I have done that. I was not compensated for this post. So I guess this means you don’t want lasagna this year for Christmas Eve? Hahahahahaha! 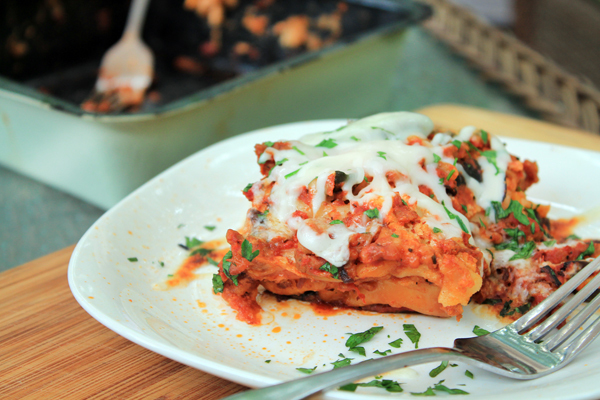 Lately I haven’t been in much of a mood for Italian food, but this lasagna (or is it lasagne? I never know) is calling my name. I think Darron would be quite pleased if I made it… Since he is “suffering” and all with the lack of Italian cuisine. This looks delicious, and the pans would be perfect for a potluck. Wait, what? You stole my cooking mojo? Give it back! 🙂 Or you totally could have used your new Chinet to bring some lasagna over the other night when my mojo really WAS gone. I’m also the type of girl who would never lend out my REAL bakeware, so this is a cool idea. This lasagna looks awesome! 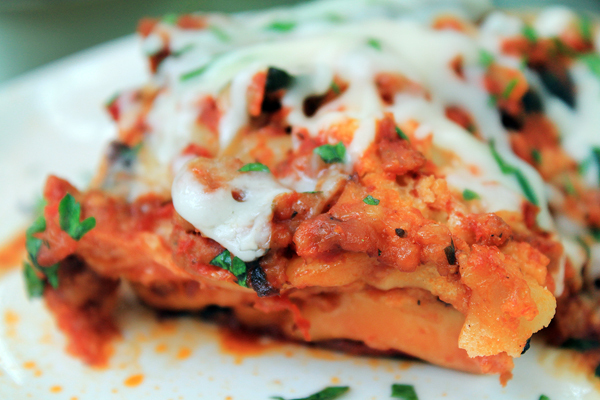 I am definitely a big lasagna lover, unlike you…but this one looks like it could win anyone over! I love Lasagna, but it can be a lot of work – I think my mouth is still gaping from James making the “too cheesy” claim – that boy and is lack of love for cheese disturbs me. I’m definitely going to look for this Chinet product – so perfect for summer barbeques. 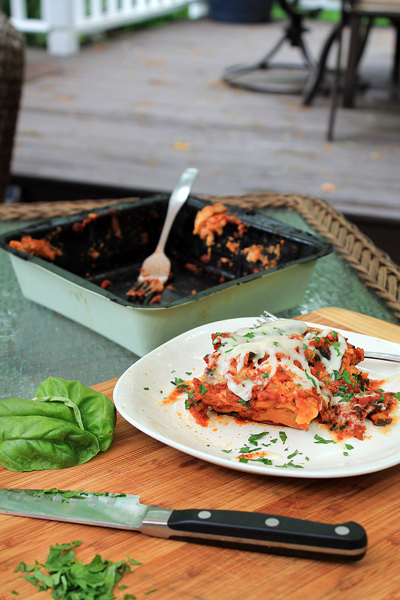 Lasagna is pretty much my favourite thing ever to eat and I love how you mixed it up here and made it healthier than the usual calorie & fat fest that it is!